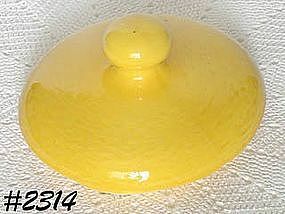 THIS IS A MCCOY COOKIE JAR PART -- THE LID FOR YELLOW PEANUT COOKIE JAR! IT'S NOT PERFECT BUT WOULD SUFFICE UNTIL A BETTER REPLACEMENT COULD BE FOUND. IT HAS HAD A 1 1/2" CHUNK BROKEN OUT OF INSIDE LIP -- IT BROKE IN 2 PIECES -- CLEAN BREAKS AND HAS BEEN NICELY RE-GLUED. PRICED TO REFLECT DAMAGE.